Parties, late night study meetings, or just time spent relaxing with friends – these are all things that cut into college students' sleep habits. The class centered round the why the body needs to sleep and the physical and mental health problems caused by a lack of sleep. This includes difficulty focusing on studies or controlling one's emotions, and increased risk of many diseases. 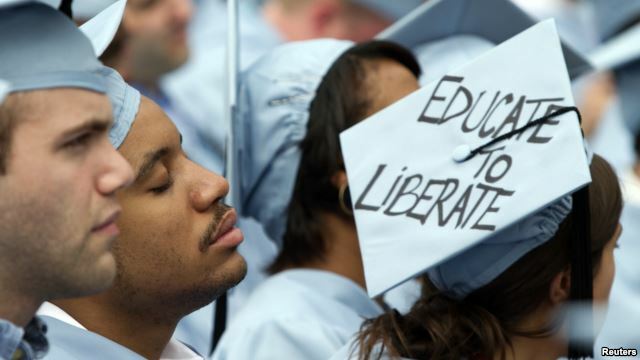 "When you are at your most sleep-deprived is when you are least likely to be able to judge how sleepy you are, and how much that sleepiness is impacting you," Scullin told VOA. The United States Centers for Disease Control and Prevention states that adults need at least seven hours of sleep a night to stay healthy. So Scullin came up with a plan to get his students to sleep more: he offered to give them extra points on their final exam, the class's most important test. 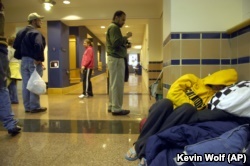 A student sleeps in the hallway of Hall Memorial Building on the campus of Gallaudet University on Friday, October 6, 2006, in Washington, DC. "Cramming" is a common activity for American college students. When students cram, they study most or all of the night before the exam. They get very little or no sleep because they think they will do better if the test material is fresh in their minds. Bessesen says there are some problems with Scullin's experiment. He says to be more scientific, the students should have been randomly chosen for sleeping or staying awake. Also, the two groups should have been studying the same subject and taking the same test. All of this may have affected the results of the study.